One of the most exciting moments for us was to watch 12 year olds programming in Python. Our record is being able to teach the use of a “for-loop” in Python to a 6-year old. Here we describe our experiences of teaching kids and learning about learning from kids. It all started with our Fast Trackers Workshop. We had a student from 1st PUC (11th standard) attending this program. 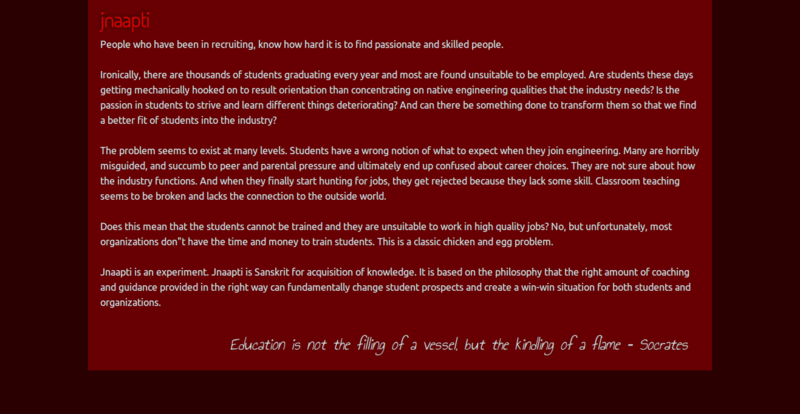 We found him to be self-motivated, sharp and he picked up concepts as easily as the engineering students. This got us wondering. If school students can learn programming, can we try with students of a younger age. What is the age at which students “get” programming? Is programming everyone’s cup of tea? Should we teach programming to everyone? When I asked these questions, Shreelakshmi told that she can help. Shreelakshmi used to run her startup in Mangaluru and as a part of this, used to teach in a school in Mangaluru. So we decided to run an experiment in her school. It was 2014, and Shreelakshmi had just moved to Bangalore. She had just assumed her new role as “Head of Training & Operations” at jnaapti in February 2014. One of her goals was to bring more visibility to jnaapti. This is an account of her experience of growing a community with technical meetup sessions. Shreelakshmi’s memories go back to the days when jnaapti was still a single person organization and was hardly known in the community. jnaapti grew to be a four member team in early 2014. It was during this phase that jnaapti was taking baby steps towards a bigger future that we are living in today. We brainstormed on how to make people around us know jnaapti and the work we do. We started looking for various ways to conduct events which will help spread our learning philosophies. That is when we came across the site Meetup.com. They say the first step is always the hardest and so it was with our meetup journey as well. Jnaapti has conducted training in over 30 companies in over 30 technologies in the last 6 years. We are the proud technology training partners to some of the best minds in the industry. Our training programs have been attended by employees of organizations like VMware, Akamai, Citrix, Ericsson, Practo, SAP Labs etc. We have trained people in organizations of varied sizes (startups, SMBs, MNCs) and with varied experience levels – freshers to people with over 20 years experience in the industry. Our youngest student is 6 years old and our oldest student is a retired doctor who was building his own startup. Professionals that we have trained play various roles in organizations; we have trained software developers, architects, test engineers, system administrators, database administrators, Devops engineers, performance engineers, full-stack developers, sales people and engineering managers. Our vision is to be able to teach anything to anyone starting from anywhere. With this in mind, we have evolved a carefully thought through training process which caters to organizations of different sizes and varied training needs. When companies plan for a training, they have various objectives in mind. Sometimes, the training is planned to meet organizational learning goals, sometimes for project specific needs, sometimes for anticipated project needs or sometimes for employee motivation. The way a training is delivered depends on these objectives. The experience level of the target audience differs. People may be learning the same technology, but they have very diverse backgrounds. The way you teach a learner fresh out of college is different from an architect who has 10 years of experience in the industry. To a fresher, you need to relate more to the concepts that they have learnt in their curriculum and why these technologies exist and what to expect from each. To an experienced person, you need to be able to relate to the technologies they already know and what they are learning now. The way you teach MongoDB to a DBA who has worked in Relational Database technology all his career is very different from a fresher who will perhaps find MongoDB more natural than a relational database! While the idea of Virtual Coach has always been in Gautham’s mind since the inception of jnaapti, a startup does not have the luxury to build the entire vision and then launch. Rather, we have to start building the minimum set of features which we can validate with our users and then iterate frequently and let usage and metrics drive the product’s evolution. Jnaapti has been doing this ever since the launch of the first version of the product. The vision of “Virtual Coach” is to eventually replace a human coach with a “Virtual” coach but in such a way that the learner does not even realize that he/she is being coached by a virtual entity. It follows the Turing test for Artificial Intelligence, but applies to learning and coaching. While we have started with software technology training, we intend to build a generic platform that has the ability to teach anything (any skill) to anyone (no bias) starting from anywhere (irrespective of what they know today). The initial idea of the training process was tested out using Email as a form of communication between the learners and the coach. As Gautham coached people, he carefully noted down the pains of using Email as the medium of communication. Learners, especially students, didn’t follow email etiquette. So while Gautham was busy downloading the attachment from the solution email, and composing his review, students would send new emails asking him to discard the old solution and consider this new one. The requirements for the first version of the product was to replace Email as the mode of communication and have the interaction around an activity grouped under a single context. 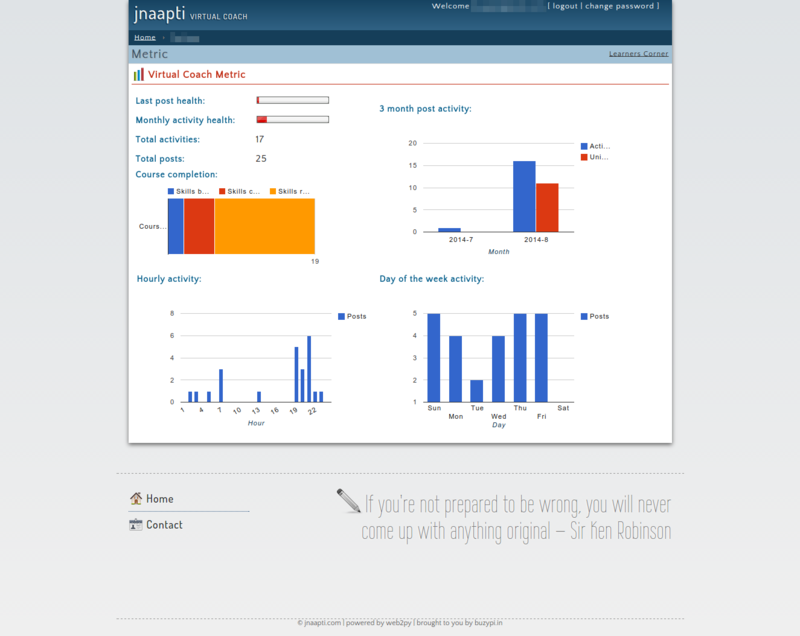 The first version of the product was called the “Jnaapti Virtual Learning Environment”, later renamed to “Virtual Coach”. While, on one side, we see students who are in the system for all the wrong reasons, there are several we come across who have a genuine interest and curiosity about the world around them. They are passionate about using technology to solve real world problems. Jnaapti tries to identify such potential students and connect them to the right places in the industry. We conduct a workshop called the “Fast Trackers Workshop” for engineering students. This workshop is a unique blend of technical and life skills delivered in an intense 5-7 days session. Students learn what aspects of their engineering is relevant to the industry needs, what else the industry expects, how to quickly learn a new technology. We show the intricate connection between the various concepts that the students learn during their engineering and how they are required to solve problems in the industry. We use the “Swimming pool philosophy – If you gotta learn swimming, jump into the swimming pool while a coach is watching you”. Within no time we make learners independent of needing a technology trainer to learn new concepts and technologies. In jnaapti, our engineers pick up a new technology within a day or two and we teach these skills to the participants of the Fast Trackers Workshops. Jnaapti was founded in May 2011 with the intention of providing quality education to the masses. We intend to build life-long learners, helping them understand the learning process and making the whole process of learning, fun and engaging. It’s been 6 years since we started and it feels like we have just started! We have learnt a lot and it has been an exciting journey so far. Very little is known about what jnaapti has done or is in the process of doing and this series of posts is an attempt to capture some of our salient experiments and our success stories. In the last 3 years of Jnaapti’s functioning, we have visited more than 20 Engineering colleges in South India and one thing that we see in common is the lack of motivation in engineering students. 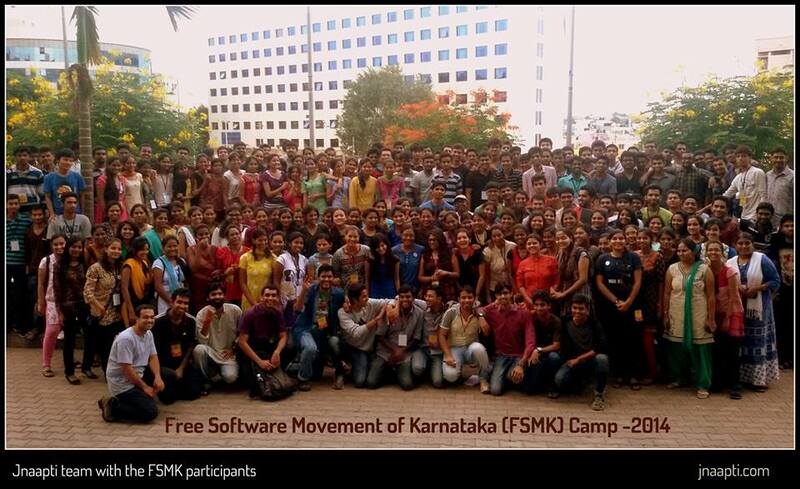 So when this is what seems like a norm, it’s always good to see organizations like Free Software Movement of Karnataka (FSMK) trying out initiatives like the FSMK Summer Camp 2014. So when one of our Meetup participants asked us if we are interested in conducting sessions on free software technologies for this upcoming camp, we blindly accepted to be a part of this. What the FSMK team was trying out was something really grand! Getting 185 participants (and another 20 odd volunteers) under one roof for a period of 9 days during the vacations and keeping their motivation levels high during the entire period is not an easy task. But like, Sarath MS (one of the key people behind FSMK) put it, “It’s better to try something this big and fail than to not give it a shot”.